Preheat the oven to 350F/180C for 15 minutes. Grease/line a muffin tin or grease a 9 inch loaf pan. In a large bowl combine together the flour, baking soda and sugar. In another bowl, mix the oil, vinegar and vanilla. 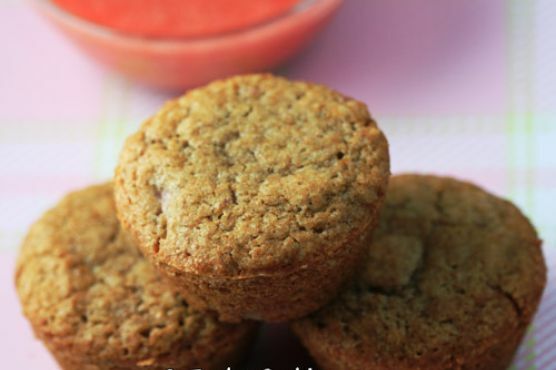 I pureed the strawberries in a blender, because I was not sure if my son would like to bite of chunks of strawberry in the muffin. Add the pureed strawberry also to the oil mixture and stir to combine. Create a well in the center of the dry ingredients and add the wet ingredients. Stir together but do not over stir. Pour the batter into the prepared muffin tins. I got exactly 12 muffins. Bake for about 22 minutes or until a toothpick inserted into the center comes out clean. If baking a loaf bake it for 40-45 minutes and check for the doneness. Remove from the oven and place on a wire rack to cool. When cool, frost the cupcakes and top each with a whole strawberry. Cream Sherry, Moscato d'Asti, and Port are my top picks for Cupcakes. A common wine pairing rule is to make sure your wine is sweeter than your food. Delicate desserts go well with Moscato d'Asti, nutty desserts with cream sherry, and caramel or chocolate desserts pair well with port.